Los Angeles has a reputation as one of the most modern cities in the U.S. – if not the world. Yet, amidst the glitz and glamor of the renowned city, you'll find countless residents who are still connected to an earlier time, and appreciate the personal connection that comes from expert house call doctors. Fortunately, those seeking out the best doctor for urgent care, Hollywood and Los Angeles residents can rest easy knowing board-certified physician Dr. Michael Farzam is available and eager to make house calls. Though it is a charming area, it perhaps comes as no surprise that urgent care in Hollywood is at times necessary. The city's busy streets and large population poses a number of risks for any resident or tourist to the area. That's why Dr. Farzam is committed to compassionate, first-rate care for every patient, right in the comfort of their own home environment. 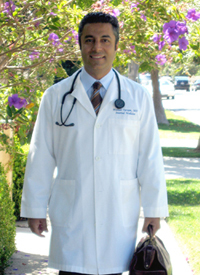 For visitors who are unfamiliar with the area, Dr. Farzam even serves as an experienced hotel physician. Hollywood denizens are always delighted to learn that no matter where they reside, Dr. Farzam will diagnose and treat most acute or chronic medical problems and minor injuries. Yet, for many who require urgent care in Hollywood, the health of the globe is equally important. That's why so many residents are thrilled to learn that, by calling Dr. Farzam for their urgent care Hollywood needs, they can significantly reduce their carbon footprint. Since House Cal Doctor L.A. is not an office-based practice, no consumption of utilities such as electricity, gas, water or traditional office supplies and electronics is utilized. Further still, we takepart in a recycling program, limited printing, and double-sided printing whenever possible. For concierge medicine, Los Angeles has numerous options. But only Dr. Michael Farzam serves as the house call doctor who works to make sure every patient has experiences optimal care without ever leaving home. If you or a loved one is in need of urgent care in Hollywood, call House Call Doctor Los Angeles by dialing (310)849-7991 today.